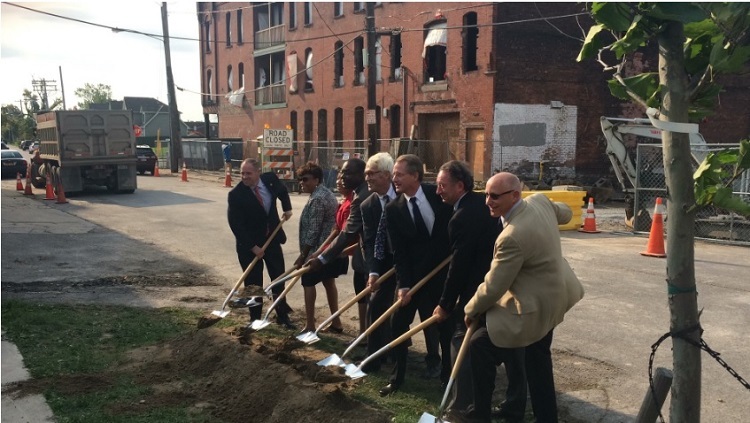 New York, NY – October 20, 2016 – (RealEstateRama) — HELP USA and Buffalo Mayor Byron Brown, today were joined by New York State Homes and Community Renewal (HCR) and the Office of Temporary Disability Assistance (OTDA), and partners to announce construction of 47 units of affordable housing for low income families and formerly homeless veterans in Buffalo. The $13 million HELP Buffalo II, at 366 Broadway, consists of two new buildings and renovation of an historic three-story building, near downtown, that will be accessible to several bus lines and rail transit. Construction is expected to be completed by mid-2017. The new space will be HELP USA’s second site in Buffalo and is across from its Hickory Street Apartments for formerly homeless single men. HELP II Buffalo will consist of one-, two- and three bedroom apartments, with 15 units for formerly homeless veterans. Amenities include a community room with warming kitchen, onsite laundry and parking, children’s playground and outdoor garden space. A full array of social services will be provided by the Matt Urban Center, including integrated health care, counseling, employment and youth services delivered by community partners in dedicated spaces. The project is being funded by a $1.9 million grant from HCR’s Housing Trust Fund Corporation and $743,700 in Low Income Housing Tax Credits that will produce more than $7.4 million in equity for the project. The development will receive $1.7 million from OTDA’s Homeless Housing and Assistance Program; $750,000 in HOME funds from the Buffalo Urban Renewal Agency; a $47,000 grant from the New York State Energy Research and Development Authority as well as funding from the Citi Foundation, Federal Home Loan Bank of New York and HELP USA. HELP USA is one of the nation’s largest homeless service providers and low-income housing developers serving at-risk populations including families, veterans, and victims of domestic violence. HELP USA currently serves more than 8,000 people every day at over 50 programs and residences across four states. Founded in 1986, HELP USA has served more than 375,000 men, women, and children and provides over 3,500 units of permanent and transitional housing. Rehab Completed on 20-unit Building in Harlem: Low Income Residents Prepare for Homeownership in coming weeks.